This article is about the minifigure of a generic ghost. For other uses of the word "ghost", see Ghost (disambiguation). Ghosts are spirits of dead minifigures, that appear in many dark and isolated regions, and within some castles. The Ghost minifigure was originally released in the Castle theme, and it has become something of an icon for the theme. There have been several different variations of the ghost released over the years. The Ghost has appeared in four different physical variations across the years, not to mention the different types of ghosts that appears in various video games. All three contained a specifically designed headgear glowing in the dark, black head, plain white torso and white arms. The first one (1990 - 1995) having white hands and 1 x 2 white tile and brick for legs. The second (1997 - 2000) having a ghost head gear and standard minifigure white legs with white hands, and the third one (2006) having yellow hands and a darker/trans glowing in the dark headgear piece. The original ghost minifigure, and also the longest lasting, featured a glow-in-the-dark cowl with a smiling expression moulded in it, a black face, and a white torso with white arms and hands. Unlike later versions, instead of having normal legs, a white 1 x 2 brick and tile were attached to the bottom of the torso. 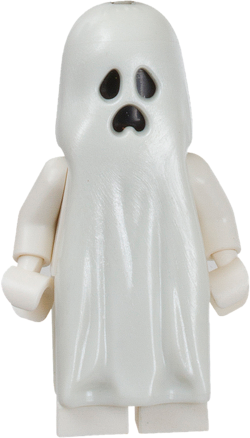 The second ghost minifigure is generally what is regarded as "the classic ghost". It is identical to the previous version in all ways, except for the inclusion of normal white legs instead of the bricks used by the original. The third version of the ghost, which was the only one seen in the first decade of the 21st century, is almost identical to it's predecessor. The only difference is that while the older ghost has white hands, this version sports yellow versions. The fourth, and most recent ghost, was released in June 2012, in the Monster Fighters theme. With a black face, and white body and hands, it would appear to be most similar to the second version of the ghost, however, this is the only ghost so far to feature a radically redesigned cowl. It is more detailed, and shows a wailing expression, in contrast to the classic smiling face, as well as a molded tip for the cowl. There is also a ghost which looks like Version Four, but it has a brick instead of legs, like the Original Ghost. This ghost could probably be Version Five. In LEGO Racers, the ghost appears as an obstacle in some tracks, and looks much the same as the second variation, which was current when the game came out. In LEGO Star Wars II: The Original Trilogy, ghosts of several Star Wars characters appear, but they simply look like glowing transparent versions of their regular forms. Like in In LEGO Star Wars II: The Original Trilogy, in LEGO Star Wars: The Complete Saga, Force Ghosts appear of several characters. The ghost is a playable character in LEGO Battles. Here, it resembles it's classic appearance. In the two LEGO Harry Potter games, ghost also much resemble the force ghost from Star Wars, in as that they are glowing transparent blue versions of normal minifigures. The ghost of Boromir appeared in LEGO The Lord of the Rings: The Video Game. The ghosts of Ben Kenobi, Anakin Skywalker and Yoda appear in the game LEGO Star Wars II: The Original Trilogy and LEGO Star Wars: The Complete Saga, although they are translucent blue versions of themselves. The ghosts of Lily Potter and James Potter appear in LEGO Harry Potter: Years 1-4 as well. A ghost appears in the game LEGO Racers as a hazard on the Dark Forest Dash track, in the first and fourth circuits, floating around and spooking racers. One was also seen in 4850307 LEGO Battles. They are seen in Lego Indiana Jones: The Original Adventures as the ghosts that come out of the ark, but without arms and legs. A ghost was possibly going to appear in LEGO Universe but was removed. He was named Monarch, possibly after the ghost in 6034 Black Monarch's Ghost. The Ghost appears in The LEGO Movie, playing a non-speaking, minor role. As well, a Ghost head/torso/body piece is used as a version of Vitruvius, who had come back from the dead. 1382 Scary Laboratory Only appears as a prop piece and doesn't have a body. This page was last edited on 7 November 2016, at 02:56.